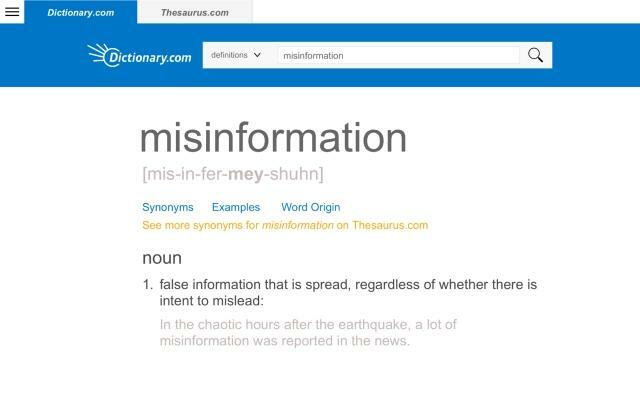 Word of the year: "Misinformation"
NEW YORK — Misinformation, as opposed to disinformation, was chosen Monday as Dictionary.com's word of the year on the tattered coattails of "toxic," picked earlier this month for the same honor by Oxford Dictionaries in these tumultuous times. Our #WordOfTheYear2018 isn't just any word. It's a call to action. We'll be sharing the tools to fight #misinformation all day today. For example, the word "mainstream" popped up a lot, spiking in January as the term "mainstream media," or MSM, grew to gargantuan proportions, wielded as an insult by some on the political right. Other words swirling around the same problem included a lookup surge in February for "white lie" after Hope Hicks, then White House communications director, admitted to telling a few for President Trump.